I read Cross-shard transfer and got a question below. 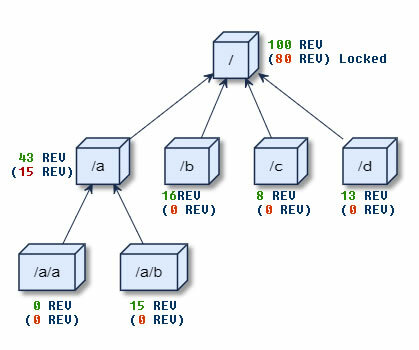 So, in the tree-style namespace(shard) solution, when REV is transferred from parent shard to child shard, Depository(aka "Fort Knox") of the child shard which located in its parent shard increased and counts the total amount in the child shard; On the contrary, if the token in the child shard is trasferred back to parent shard, the amount in depository decreases. The amount transferred into child shard can be treated as Locked Amount. e.g. Alice has 100 REV in total, she transferred 80 REV into child shards, then Alice still has 100 REV in parent shard but 80 REV is locked. If this assumption is correct, then Alice can continue move REV into child shard's descendants. The unlocked amount in each shard can be seen as a purse. And this means that, the cross-shard transfer is not always needed. e.g. If Alice needs to pay 1 REV in /a/b shard, she already has a purse with 15 REV in that shard, no cross-shard transfer is required. Even further the deduction in parent shards can happen in a batch process. I want to make it clear -- Can wallet/purse work in this way?